Yesterday was a relatively quiet day, with the EIA’s inventory report causing markets to fall and rise back up again, yielding a net change of just +5 cents. Those 5 cents pushed prices up above $62, the first time markets have closed above $62 since December 2014. Today, crude prices are trending lower, with prices currently at $61.47, a loss of 54 cents (-0.9%). 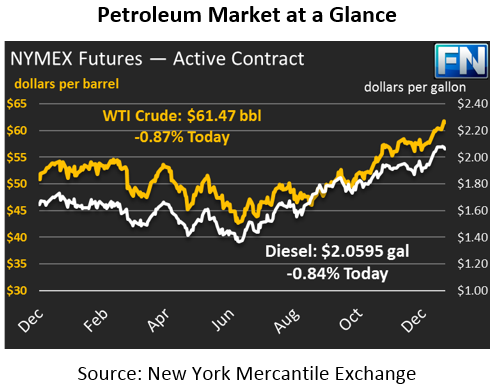 Refined fuels are leading crude prices lower, with bigger losses on a percentage basis. After falling 0.8 cents yesterday, diesel prices are continuing their decline, shedding 1.8 cents (-0.8%) today to trade at $2.0595. Like crude oil, gasoline traded flat yesterday with a net price change of 0.01 cents. Today, prices have dropped 1.0 cent (-0.5%), with prices currently at $1.7971. The EIA published their weekly inventory report yesterday, and the data showed big inventory movements in both directions. Crude oil stocks fell 7.5 million barrels (MMbbls), roughly 50% more than market expectations. Crude inventories typically fall during December, as suppliers attempt to avoid end-of-year tax liability. Equally as common is inventory builds during January, so expect to see inventories rise in the coming weeks. In contrast to crude, gasoline and diesel saw huge stock builds; again, a common end-of-year phenomenon. While the huge build has helped keep fuel prices moderate over the last 24-hours, traders will not be held back for long. Strong heating demand in the northeast is depleting both natural gas and heating oil inventories, so markets will be expecting a notable draw next week. Around the world, refineries have been rallying to send fuel to the U.S. Diesel refining margins in Europe have been supported by the strong demand in the U.S. Barges full of diesel fuel are making their way from Europe and other major production areas, taking advantage of high prices in the Northeast. In the U.S., refineries scheduled for maintenance have delayed repair efforts to continue producing fuel for undersupplied markets. While inventories in the Northeast are at their lowest point in years, markets are working to replenish stocks and keep consumers heated.